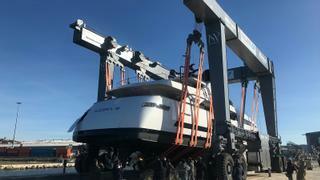 Italian yard ISA Yachts has delivered its ISA Alloy 43 yacht named Agora III. 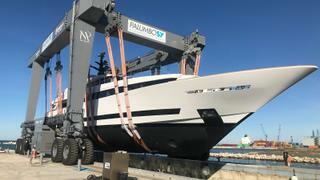 The delivery ceremony for the 43 metre yacht took place at the Palumbo Superyachts' Ancona shipyard on February 21. Built entirely in aluminium, Agora III is the first superyacht in the yard's Alloy 43 metre series. Built for a Japanese owner, she will become the largest private yacht operating in the country. Sold in summer 2017, the yacht was launched and underwent sea trials last month. This 330GT yacht will accommodate ten guests split across five cabins, including a main-deck master suite, while the crew quarters will allow for a staff of up to seven people. The styling, both interior and exterior, was handled by Italian designer Luca Dini. Comprised of an aluminium hull and superstructure, the ISA Alloy 43 features naval architecture developed by the in-house team. Gianpaolo Lapenna, project and product executive director at ISA Yachts, previously said: “This semi-displacement superyacht aims to deliver the best possible combination between performance and comfort, with a particular focus on sound and vibration, especially required by the owner from the very beginning." Key features will include a large superyacht sundeck with separate areas for lounging and dining, while the beach club boasts armchairs just a few steps from the water. Power will come from a pair of 2,00hp MTU engines, allowing for cruising at 18 knots, topping out at 20 knots.